It’s surprising how long we’ve had since a solid Bajoran episode of Star Trek: Deep Space Nine. 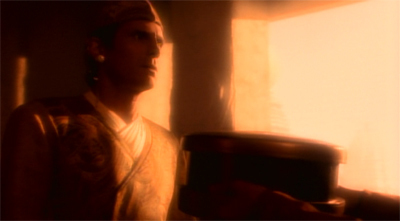 Barring the dark reflection of Bajor as a power-broker (and brief allusion to a colony in the Gamma Quadrant) in Crossover, the last episode to really explore the planet’s political and religious structure was probably Sanctuary, which aired more than half a season earlier. After a reasonably high concentration of Bajoran political adventures in the first season and the first half of the second, it seems that further explorations will be more broadly spaced. 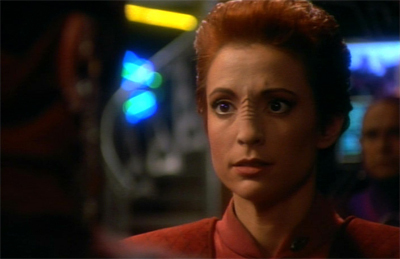 Indeed, the first season ended (and the second season began) with a five-episode run that was heavily anchored in the show’s Bajoran surroundings. However, as of late, it feels we’ve been strangely disengaged from the show’s stated objective of welcoming Bajor to the Federation. With episodes like The Maquis, it seems like the show is making a conscious effort to disentangle Cardassian politics from those of Bajor. In a way, this probably represents Deep Space Nine growing into the form that it will take for the rest of its run. The second season has really been about Deep Space Nine figuring out what it wants to be, and what it doesn’t want to be. With The Collaborator‘s focus on Bajoran politics feeling conspicuous by the lack of other Bajor-centric episodes in this half of the season, it seems like Deep Space Nine doesn’t want to be a show about Bajor. That is – to be fair – a bit of a slight overstatement. Bajor isn’t going anywhere. Winn and Bareil will remain members of the recurring cast. We’ll even get a few other recurring Bajoran guest characters as the show continues. Bajor will remain a vital part of the show’s mythology, and the series will pay due attention to its internal politics and its place int he grand scheme of things. After all, Deep Space Nine is set on a station. It can’t go anywhere. At the same time, you can see the show drifting. While many of the early Cardassian-centric episodes were focused on the relationship between Bajor and Cardassia (episodes like Cardassians, Duet, The Circle), the show is beginning to branch out a bit. In the very next episode, the crew will take a trip to Cardassia that has nothing to do with Bajor. 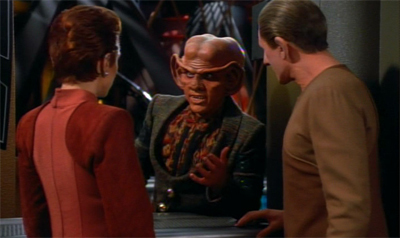 The next episode to focus on the mysterious wormhole aliens will be the Ferengi-centric Prophet Motive. In fact, Sisko’s biggest bargain with those ethereal entities will focus on the Dominion, treating Bajor as a tertiary party in negotiations between the Alpha Quadrant powers and the Prophets about the fate of the galaxy. When the Bajoran colony so casually name-dropped in the introduction to Crossover is so brutally and so casually destroyed in The Jem’Hadar, it seems to be to send a message to Starfleet rather than the Bajorans. Bajor remains conspicuously neutral in the conflict between the galactic powers, despite the fact it is the first victim of Jem’Hadar hostility. It’s a far cry from the mission statement laid out in Emissary. The pilot revelled in the Bajoran mysticism and teased about the stolen Orbs of the Prophets. One or another was found or returned over the course of the show, but it never seemed like Bajor took centre-stage. After all, Sisko’s primary purpose on Deep Space Nine was to prepare Bajor for entry into the Federation. 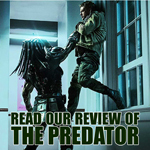 At the risk of offering any spoilers to any neophytes stumbling across the reviews, he doesn’t. The show’s mission statement is left to be resolved in the tie-in novels. There are several possible and credible justifications for the show’s decision to shift focus away from Bajor. Although syndication allowed Deep Space Nine a relatively large degree of freedom, it was still a piece of American television. As such, it was inevitably driven to a certain extent by the business realities of the medium. And the ratings make a compelling argument for shifting focus away from Bajor and its politics. In purely practical terms, the Nielsen ratings for the Bajor-heavy episodes were never that high. 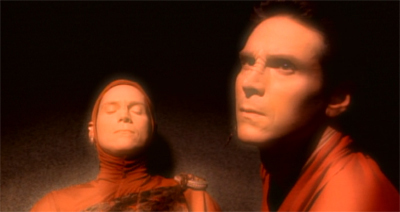 Duet and In the Hands of the Prophets were the two lowest-rated episodes of the first season, the only two episodes scoring lower than 9.0. While The Homecoming started the second-season off strong with a 9.7, the next two episodes dropped sharply to 9.0 each. Of course, it’s hard to argue for a trend here. Shows typically start out strong and haemorrhage viewers as they progress. 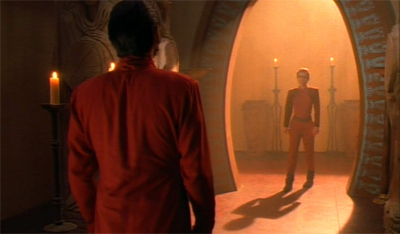 It’s logical that Duet and In the Hands of the Prophets would be the lowest-rated episodes of the first season; they were the last two to air. Of course, this is hardly scientific. Certainly, there was never a sharp drop for the later season Bajoran episodes, and definitely nothing as steep as for The Collaborator. Still, there’s a sense that Deep Space Nine grew a little more distant from Bajoran politics over the run. 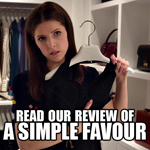 It was definitely still part of the show’s fabric, but the emphasis grew weaker. It seems like the decision to move the station from the orbit of Bajor to the mouth of the wormhole in Emissary was largely symbolic, as the show began to focus more heavily on the Dominion threat than Bajoran concerns. The face of the frenemy? Of course, Deep Space Nine was in a transitional period during the second season, trying to figure out what worked and what didn’t. The show is already quite distinct from the series that opened its second season with The Homecoming. For one thing, the influence of Ira Steven Behr has been steadily increasing, as the other producers focused their efforts on the upcoming Star Trek: Voyager. And Behr’s view of the franchise is quite distinct from that of Rick Berman, Jeri Taylor or Michael Piller. Given the post-colonial vibe of come of the episodes overseen by Behr, it’s quite possible to argue that Behr simply wasn’t interesting in pursuing a story about a a small world being recruited to join the Federation. There are slightly colonial overtures to the whole “Bajor must join the Federation” arc, particularly in Picard’s instruction that Sisko must “do everything short of violating the Prime Directive to make sure” that Bajor becomes “ready” to join the interstellar community. After all, Bajor just came out of a brutal occupation by a colonial power. Would it be so bad if they retained their own identity for a while? The question of Bajor and the Federation is fleetingly raised in The Collaborator, with Sisko and Winn discussing her views on membership. When Winn tries to cosy up to Sisko to secure her base, the Emissary is quick to try to turn the topic to his advantage. So the Prime Directive is maintained. 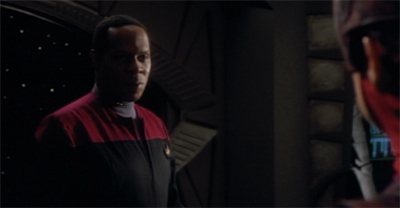 Sisko does not interfere, directly – even if the interference might advance his mission on Bajor. That said, even if Sisko were willing to break the Prime Directive and deal with the devil, it seems unlikely he’d be dumb enough to count on Winn keeping her word. Still, there’s something uncomfortable about the scene, and the show plays the ambiguities quite well. While Sisko refuses to directly engage with the election, he is willing to offer his endorsement to Winn outside of election season in return for support of his agenda. He might just be needling Winn to see how many principles she’d sacrifice for power, but there’s also a sense that Sisko is a competent political animal in his own right. More than that, though, there’s also the suggestion that Sisko has been indirectly engaged with the Choosing. “It’s common knowledge that you support Vedek Bareil,” Winn notes. “Although I have been pleasantly surprised that you haven’t made any public statement to that effect.” Of course, how Winn gauges or measures “common knowledge” is unlikely to be scientific. At the same time, Deep Space Nine suggests that it’s impossible for Sisko to be completely apolitical. 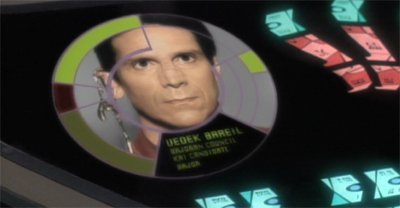 His job isn’t to act in the best interests of Bajor as a political entity in its own right – indeed, his principles tell him that it’s not his position to presume to know those best interests. However, those principles would also seem to be at odds with his role as an intergalactic recruitment agent. Sisko is not impartial, because he has a very clear agenda tying into Bajoran politics. His mission is to get Bajor to join the Federation. If that means appearing in public with and implicitly endorsing Winn Adami (outside of election season), he’ll do it. The Collaborator seems quite wary of the colonial undertones of Sisko’s mission to Bajor. 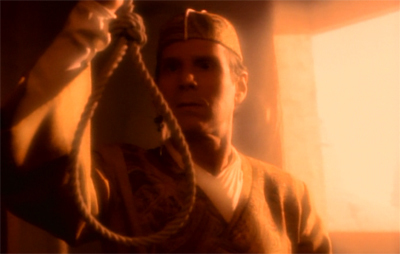 One suspects that this is part of the reason why the biggest moment in the whole “Bajor joins the Federation” arc comes in the fifth season’s Rapture, as Bajor says no. Sure, there are important plot reasons for that decision – given the season’s final episode – but the conversation is never revisited. As far as Deep Space Nine is concerned, the final answer is “no.” Well, Sisko offers us the assurance that “one day Bajor will join the Federation – that I’m sure of”, but it’s never brought up again. Still, all of this is in the future and in the abstract. We should be talking about The Collaborator, which stands out as the first Bajoran episode in quite some time. And – in keeping with a lot of late second season Deep Space Nine – it’s really clever and exceedingly well constructed. It even manages to make Vedik Bareil seem almost interesting, which is no small accomplishment when you consider how wooden Philip Anglim’s performance can be at times. It seems like the writers are hitting Bareil’s sweet spot here, as much as the character has a sweet spot. 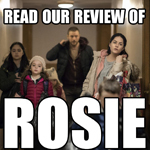 Unlike In the Hands of the Prophets, the show doesn’t try to paint the character as something of a liberal radical with cheeky stories and a finely-honed sense of politics. Also, now that he’s hooked up with Kira, the show has dropped the slightly creepy “mentor and would-be lover” vibe that made him seem a little strange in The Circle and The Siege. Instead, Bareil is just a guy who is too stoic for his own his good. At the start of The Collaborator, he seems quietly confident that he’ll be elected Kai. He’s not shouting it from the roofs or anything, and not taking it for granted, but you get the sense that he is the front runner and he knows he’s the front runner. Being honest, it’s also the only portrayal of this whole Kai election that makes sense. Opaka’s been gone a year now, but there’s been no indication that Bajor’s been in religious turmoil since at least the events of The Siege. Making Bareil the heir apparent and the presumed successor to the throne explains how this big religious election could be both unresolved and a non-issue for so long. It’s effectively a one-horse race after the events of In the Hands of the Prophets through The Siege. Bareil isn’t a candidate so much as he’s Kai-in-waiting. After so many episodes about political uncertainty on Bajor, there’s something quite comforting in the thought that something as vital as this could have been playing out behind the scenes without attracting the attention of our heroes. The Collaborator is probably – along with Life Support – the episode that makes the best use of Philip Anglim as a guest star. Anglim’s performance style seems suited to a guy so used to hiding stuff that he’s become numb and distant, and we can immediately buy Bareil as the kind of character who has done something a little dodgy in the past but has very thoroughly buried it. The episode also makes good use of surreal Orb visions. 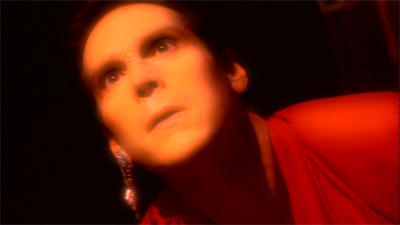 I’m a sucker for absurdist dream imagery, and – while the washed-out golden hue looks a little dated and hazy (if only we had a remastered version of Deep Space Nine coming out) it’s vivid enough to be interesting. 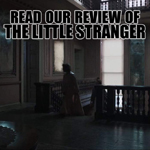 The use of imagery like vicious snakes, bloody daggers and hanging bodies is eye-catching enough that it doesn’t seem like a bunch of actors spouting vague nonsense in order to eat up screen time. 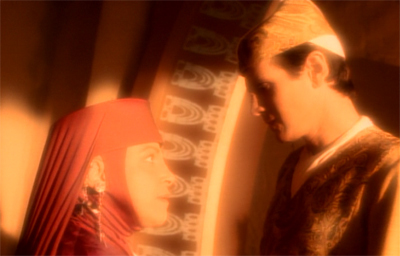 We get a bit more insight into the Bajoran religion here. The show has kept the concept sort of vague. In The Circle, we discover that Kira keeps an alter in her quarters. In Crossover, it’s hinted that meditation might be a daily means of religious observance. 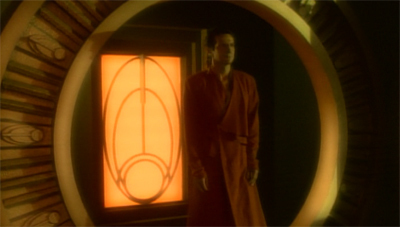 We know that there’s a temple on the station, and that it offers sermons and services, but there’s very little real sense of what observance of the Bajoran religion actually entails. Here, the show seems to emphasis the religion as relatively progressive and democratic. Although the show has alluded to the selection of a replacement for Kai Opaka, The Collaborator suggests that it will be an entirely democratic process. “Are you going to vote for me?” he jokingly asks Kira, although the length and extent of their vote suggests that she really does have a vote to cast in the selection of a new Kai. This isn’t the sort of restrictive or exclusive in-house vote that we might have expected, given the existence of an organisation like the Vedek Assembly. 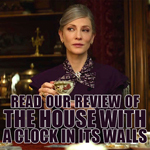 Instead, it seems thoroughly modern, open and transparent. Also quite charming is the idea that Bareil isn’t hounded by the press or treated as a celebrity. The election for Kai is a big deal, but it doesn’t seem like a rat-race. Even Winn’s reluctance to directly (or even indirectly) leak the accusations against Bareil suggests that negative campaigning is frowned upon. 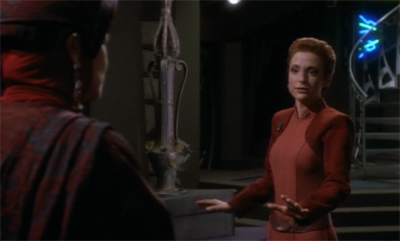 There’s also something quite wonderful and hopeful in the idea that the Bajoran religion can be open to interpretation and debate. As alluded to in Shadowplay, Kira doesn’t entirely agree with Bareil’s approach to key scripture. However, that doesn’t mean that she can’t love Bareil, and it certainly doesn’t mean that she can’t in good conscience vote for him. “I may not always agree with your interpretations of the prophecies, but I think you will make a wonderful Kai,” she states, in a wonderfully enlightened manner. 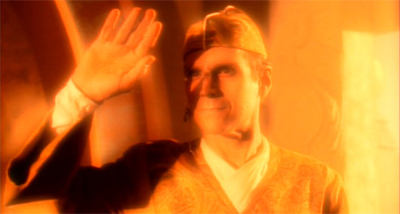 In a way, the portrayal of the Bajoran religion demonstrates that Roddenberry’s utopian ideals are not incompatible with organised religion, despite the decidedly atheist subtext of some of his later Star Trek work. It is possible for people with different belief systems to coexist. In the Hands of the Prophets suggested that Kira’s political and religious compass aligned rather closely with that of Vedek Winn, and her frequent disagreements with Bareil suggest she hasn’t moved too far away from that position. However, Kira can hold those beliefs without becoming as vitriolic or as angry as Vedek Winn. It’s not the individual beliefs that matter, it’s how the person reconciles those beliefs with the wider world. It’s a rather heartwarming message, and I don’t think Deep Space Nine gets enough credit for approaching that topic. The show is frequently accused of being cynical, but it was also an exploration of how fundamentally different people could get along without compromising anything of who they were. That sounds like Star Trek to me. It’s a rather enlightened view – decidedly “New Testament.” Bareil seems to imply that the Prophets love their children no matter what. They do not require strict adherence to worship, devotion to ritual or even belief. They instead smile benignly upon the Bajoran people like concerned parents. Indeed, Bareil’s view seems to synch up with the show’s portrayal of the Prophets. While they have a fondness for Bajor and “the Sisko” (as evidenced in The Sacrifice of Angels), they don’t seem to be too bothered by Sisko’s beliefs or those of the planet below. In a year when TV airwaves are aflutter with winged spirits, the bestseller lists are clogged with divine manuscripts and visions of the afterlife, and gangsta-rappers are elbowed aside on the pop charts for the hushed prayers of Benedictine monks, you don’t have to look hard to find that pop culture is going gaga for spirituality. [However,] seekers of the day are apt to peel away the tough theological stuff and pluck out the most dulcet elements of faith, coming up with a soothing sampler of Judeo-Christian imagery, Eastern meditation, self-help lingo, a vaguely conservative craving for ‘virtue,’ and a loopy New Age pursuit of ‘peace.’ This happy free-for-all, appealing to Baptists and stargazers alike, comes off more like Forrest Gump’s ubiquitous ‘boxa chocolates’ than like any real system of belief. You never know what you’re going to get. In a way, you could try to contextualise the conflict between Bareil and Winn as part of a larger media conflict in the nineties between traditional Catholic ideology and more new age religious beliefs. Alternatively, the election contest between Bareil and Winn could be read as a conflict between a more liberal belief system and more traditional religious values. It could also be seen as an expression of a more overt political conflict playing out in American culture during the nineties. James Davison Hunter introduced the term into the popular lexicon with the publication of Culture Wars: The Struggle to Define America in 1991, and Republican Pat Buchanan used the term during his address to the Republican National Convention in 1992. Bill Clinton was religious. Bill Clinton could quote Scripture with the best of them. Bill Clinton could preach with the best of them. He gave some very powerful speeches at Notre Dame, where he sounded Catholic; at African-American churches, where he sounded AME or Baptist. Now, these all overlap. It wasn’t contradictory. And he quoted Scripture at least as much, if not more than George W. Bush does. The Clintons maintained ties to various religious organisations and figures during their time in office. Indeed, Hilary Clinton’s 1993 “politics of meaning” speech was drawn from Rabbi Michael Lerner, who would publish The Left Hand of God in 2004. The culture war in American politics wasn’t necessarily religion-against-secularism, it was about two different ideas of faith conflicting. Although his handling of some cultural issues resulted in temporary increases in Democratic vote totals, the underlying structure of cultural issues persisted. While some moderate mainline Protestants, Catholics, and Hispanic Protestants moved toward the Democrats as a result of the president’s careful triangulation, most evangelical Protestants – the new core of the GOP – actually moved farther away. And this is not surprising: the fundamental cultural positions of the Clinton administration did little to appease the strong concerns of this constituency over abortion, gay rights, school choice, and similar issues. The administration’s moderate positions on personal responsibility, school violence and V-chips appealed to some religious traditionalists, but not to most evangelicals. On the other end, the strong approval Clinton received from religious minorities and secular citizens often reflected support for the same policies that evangelical traditionalists found so distasteful. A gateway to the future? There’s a fascinating ethical issue here. Can a lie ever be better than the truth? Is hope build on something patently untrue completely worthless? Is it valid to destroy everything good that has come from a person’s legacy by shattering the public perception of them? At the same time, who has the right to decide such things? Who holds the moral authority to decide whether the people can or can’t be trusted? What gives Bareil and Kira (and Winn) just cause to withhold such information? In a way, The Collaborator calls to mind the climax of Christopher Nolan’s The Dark Knight, where Batman and James Gordon conspire to secure Gotham’s future on the basis of a myth concocted about Harvey Dent. Released at the height of the War on Terror, The Dark Knight generated no shortage of debate about the idea of lying to the public in the pursuit of the greater good. 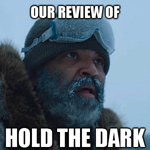 Indeed, a significant portion of The Dark Knight Rises seems intended to directly deconstruct that position by demonstrating how fragile the unity built on a lie can be. The Collaborator never delves too heavily into the matter. Indeed, it might have been nice to see the issue return to haunt Bajor a few years down the line. Like what is arguably the show’s strongest hour, In the Pale Moonlight, the show puts an incredible amount of weight upon a few shoulders. The Collaborator never really offers a definitive answer one way or the other on the matter. 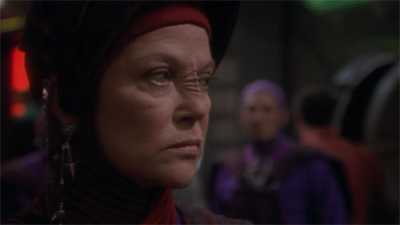 It allows Opaka to retain her status as a hero, securing Bajor’s romanticised past. But that lie allows Winn to become Kai, effectively undermining Bajor’s future. At the same time, The Collaborator is also a pretty brilliant piece of character-based storytelling. The central mystery concerns Bareil, but the episode also thrusts Kira into the role of investigator, tasked with figuring out what her lover is hiding. 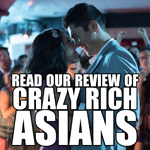 It seems like a pretty gimmicky set-up – Kira discovers her lover has a dark secret! – but it fits what we know of Kira as a character. Kira is a character who has seen the worst in people. There’s a reason that Tribunal cast her as the devil’s advocate when O’Brien is accused of treachery. Kira didn’t grow up in a post-scarcity paradise where a replicator could provide everything she needs. In Shadowplay, she explains to Bareil that she grew up in a refugee camp. (With two brothers – by the way – who never show up on the show, so make what inferences you will.) Kira liberated a labour camp that Duet tried to paint as a futuristic Auschwitz. 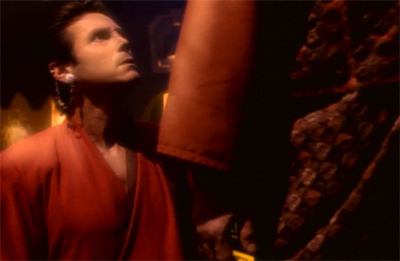 Necessary Evil showed us that Kira even had to kill Bajorans to help liberate her planet. It’s a pretty crappy personal history, and the fact that Kira has been to hell and back helps the episode’s introductory sequence seem heart-warming rather than overly saccharine. If anybody deserves the right to be happily and goofily in love making out with a handsome (if boring) shirtless hunk, it’s Kira. She has earned a break. And yet we know enough of her character to know that she will never be completely blindsided by Bareil because she’ll never let her guard down completely. She won’t overlook a potential scab because it might undermine her happiness. She’ll go poking at it, because she knows what those sorts of things can hide. 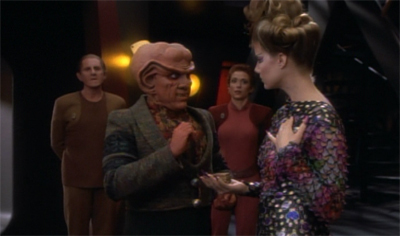 She confesses her love of Bareil to Odo in a wonderfully heartbreaking sequence. (How does she not know he’s in love with her – “you humanoids… when it comes to emotional attachments, you never see the obvious” indeed!) It’s a moment that could seem cynical or coy, or at odds with the fact that she’s sabotaging his election bid, but instead it feels perfectly in keeping with what we know of her. 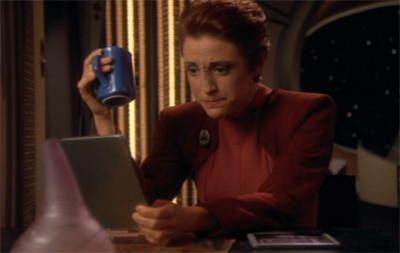 That said, the only real question I have is how Kubus Oak is a collaborator and Odo isn’t. 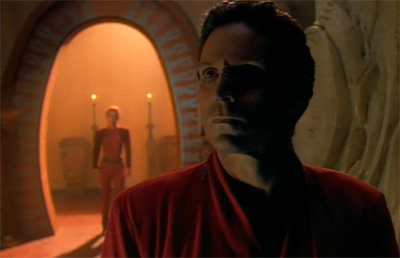 Kubus signed what amounted to death warrants for the Cardassians, but episodes like Things Past and even Necessary Evil make it clear that Odo wasn’t above handing Bajorans over to the authorities to face execution. The only difference was that (Things Past notwithstanding) Odo probably felt the people being executed deserved it. 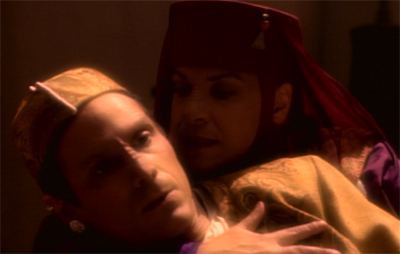 However, while that’s a nice character beat, I always felt it strange that the Bajorans were so quick to forgive. 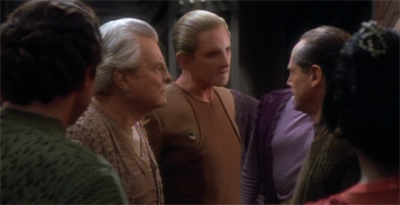 Obviously, Odo’s conduct isn’t too similar to that of Kubus, but I find it interesting that Kubus is punished so harshly while Odo is let off scot free. Still, The Collaborator is a pretty wonderful piece of television, and another example of how Deep Space Nine has really found its feet. 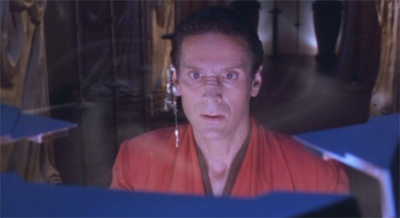 Although Prophet Motive is the next episode to meet the Prophets, I always thought Destiny was the next one to tackle Bajoran religion and Sisko’s status as the Emissary. 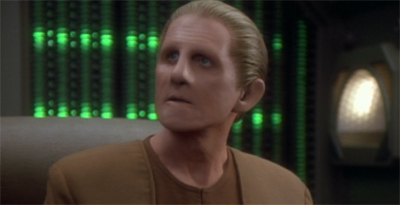 I agree with your doubts about Odo – the same thing occurred to me. 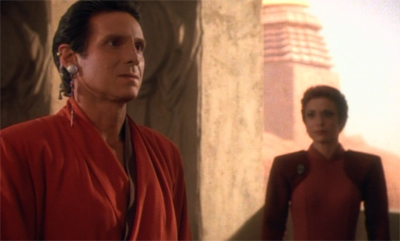 Part of that might be explained by his “otherness” (he is no real Bajoran), another part might be that he seems to have a much more neutral position, really caring for the law wheras the “true” collaborators merely were in it for their own sake. But it seems to be a bit strange, especially given Odo’s very self-righteous reaction to Kubus. Other than that it is one of my favorite early shows. I also found Bareil/Anglim’s acting very fitting and his serene aura very compelling here as it served the character story, much better somehow than in previous episodes. The end is heart-breaking and quite foreshadowing (where will Winn lead Bajor?). And I loved Sisko’s dialogue with Winn and his witty smile during that. The Collaborator is probably one of my favourite Bajor stories, and proof that the concept can work. It’s a shame that the show couldn’t keep doing one or two of these a year. I’d much rather two or three episodes like this than anything involving the Pah-Wraiths. I couldn’t agree more. The only, literally the only thing I dislike about DS9’s mythos is the Pah Wraith-stuff. The err too much on the side of fantasy for my taste. It could have been handled better, too. I recently read this “Millenium”-trilogy by Reeves-Stevens. 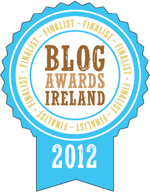 Long read, okay/interesting at times, but it was more proof of how difficult it is to get this right. That said, the main problem is the nature of the Prophets or the ground of the Bajoran faith in general. It is undecided, but much more concrete than say monotheistic religion on our world. This ambivalence invites a lot of problems and storytelling opportunities at the same time.